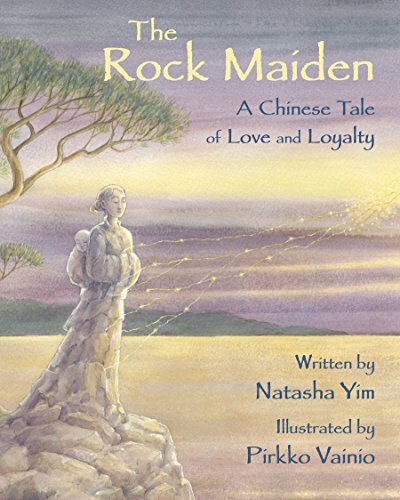 After receiving outstanding reviews for her book Goldy Luck and the Three Pandas in 2015, Natasha Yim returns with an endearing and elegant story in The Rock Maiden. Intrigued by the Amah Rock in Sha Tin, Hong Kong, Yim succeeds in transferring a sense of awe and wonder at the majesty of such a striking natural formation. She retells an ancient Chinese legend in an age appropriate manner, updates the ending, and presents a beautifully touching image of love and loyalty, thus making the book’s title exceptionally accurate. The lovely Ling Yee and the kind fisherman, Ching Yin, fall in love, have a wedding, have a baby, and live out their blissful life in a bustling fishing village. One day a terrible storm comes, and Ching Yin’s sampan is lost at sea. Devastated yet hopeful, Ling Yee and her infant son keep watch from a cliff overlooking the ocean. She refuses to listen to the negative jeering from the villagers and insists that Ching Yin will soon return to them. Day after day, moon after moon, she waits and watches. Her heartbroken parents plead to the patron goddess of fishermen, Tin Hau, for help in alleviating Ling Yee’s sorrow. Tin Hau responds by turning Ling Yee and her son into stone so they will mourn no more. By and by another year passes when a scruffy stranger enters the village asking for Ling Yee. When the villagers recognize the man as Ching Yin they are dismayed to have to tell him what happened to his wife and son up on the cliff. Undaunted, Ching Yin rushes up the cliff and falls to his knees at the foot of the rock statue. Moved by his display of love, Tin Hau splits the rock, and Ling Yee and her son return to flesh and bone. The villagers rejoice, celebrate, feast, and give thanks, which Tin Hau gracefully accepts. In spite of the minor discord of Ching Yin appearing older and vagabond-ish while Ling Yee and the baby appear un-aged and frozen in time, this is a sweet story with a well-presented happy ending. The story matches perfectly with the dreamy and authentically appealing illustrations of award-winning Finnish artist Pirkko Vainio, making The Rock Maiden a charming and very satisfying read.